On the second(11th) level (all 12 levels I am speaking of now is on our side), there appeared gigantic bundles or groups of petals. These groups dealt with further brainstorming and the development of the Dark Sea itself, how it will expand itself. Then… those who will create projections of living creatures were created. The 8th and 7th levels are similar. But the 8th level is not separated from the projection. They created them but they don’t observe them. And the 7th level are those who observe their projections. Located on the 7th level are the twists which I had drawn… Those are the bundles which created humans, animals and everything living, including planets and stars…They partook in this process too; but chiefly smaller projections. In reality these are not such small things… There are many other creatures that were created and continue to function. “Were”, is not the right word but Time... use of the word Time… The main distinctive feature, is that they have a ray and an Assemblage Point on its end. Everything situated on 6th, 5th, 4th, 3rd 2nd and 1st levels are different projections of levels from 7 to 12. The 6th level is close to the 7th – the projections are full of energy and perceive themselves as pure energy. But still they have an Assemblage Point. The Double doesn’t have an Assemblage Point as they consist of the petal, and every petal is an original projection of the Dark Sea. The Original Source in this context is the 1st petal. Besides, on the levels from 5th to 3rd there are bubbles of the worlds. Since beginning from 5th the bubbles eventually disappear. There may be gigantic areas towards the upper edge of the 5th Density level where a being perceives almost the entire level... or at least large part of it, but at the lower levels bubbles are still present. The 4rth and the 3rd are the bubbles. And at lower level there are sort of forms. On the other side it begins similarly with the creative groups... but the projections are in a different sequence from ours. The first three levels are the same. But on the levels from the 9th to 7th, there are projections of beings, very interesting beings which are hard to describe. They are big… And the bubbles of the worlds are on the 7th and 8th level. And they also have beings on the 4th level. On the 3rd level I don’t remember any beings. 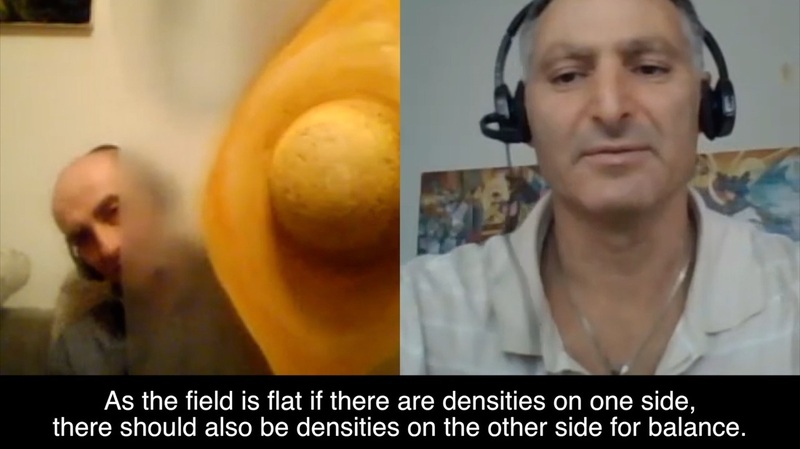 2nd Density level is analogous to ours – there are structures from our side it is 22nd, 23rd, 24th levels and the outer fringe similar to the one from our side. Regarding the meaning of the two sides, earnestly, I was thinking about it myself. Why not! The balance! I understand , although this is only an assumption and I don’t know for sure. The Dark Sea spread along the surface of the field. The field is flat. This part, the density levels are situated there, they are located this way. They divided along this ball. As the field is flat... if there are densities on one side, there should also be densities on the other side for balance. I don’t know. I can’t recollect it but I don’t believe it’s important. The base is in the middle, the essence and the energetic source is the ball, in the middle. Regarding significance of number twelve, that is the reason. Here I can say with certainty that the reason is exactly in the number of densities. To be earnest, we have encountered Dark Seas that developed only small part without developing symmetry. They looked very sickly. Earth looks different ways. You can see the bubble of awareness of the Earth, you can see the ray of its projection. The Earth is connected to the Sun. Its ray, similar to ours, is connected to the Sun. You can see the darkness that composes this wonderful being, you can see the light of a shining crystal, you can see its levels of awareness. You can help it to organize these levels because now is the time when new energy came and many seers, not just seers of my group and our lineage, but very many, thousands of self-aware beings are helping it to install these levels. There are indeed completely separate groups, all over the Earth; and individual beings, who are helping the planet out in dreaming and in everyday life. Now is a very interesting time. People are much more aware and geared for creativity. They want to create. One more picture. The picture is on the topic of perception. Perception is the base for everything that happens to us. Since the majority of humans are still bubbles, the perception is based on fibers that constitute this bubble – cocoon. When the cocoon directs its attention onto something we emanate ultra-thin shining threads that consist of energy... of the same awareness that constitute the whole universe. We direct them onto something. And what is interesting is that in response this “something” directs its threads towards us; it doesn’t matter whether it is a living being or a being we call not living, artificial or natural. Then we have this funny picture. Here is the cocoon and the threads emanate from it. As soon as the threads are directed towards the stone, the threads from the stone are directed in the opposite direction. The stone doesn’t direct attention. The stone directs threads. And the same happens with everything. Everything directs threads towards each other. But living beings command attention, they direct threads consciously... but it attracts attract threads from everything, natural and artificial alike. The Earth is our mother. The projection of the Double wouldn’t be complete without the motherboard upon which the projection is applied. We are a sort of blend. On one hand we are the eye of the Double... placed on top of a long tentacle, like a half solid eye of a butterfly’s cirrus or a snail’s cirrus. And on the other hand this antenna enters the density which we call the Earth. There are plates of worlds and when it enters them it encounters with the thought of the Earth and a cocoon is created. We are a blend of awareness coming from the 7th density and the thought of the planet itself. The Double sees everything differently. It doesn’t see the planet. It doesn’t even understand what a ball or a planet is. It sees the Earth as a conglomerate of energy fields. It doesn’t mean the Double doesn’t relate to this conglomerate with respect. It loves and respects it deeply. There is cooperation happening. Everyone is doing its job. Since we in part, are the thought of the Earth, we cooperate with it very efficiently. Either way we are its children. From the Double’s perspective the Earth is a conglomerate of energy fields. It is curved, strange, moving plates or like chunks of dough. It’s hard to describe... some levels are reminiscent of slices of yellow cheese with holes. Besides, the Double sees motion of colourful petals moving along the streams around our planet. These are rising and intermixing streams… different perspectives, different states of awareness. that works for us now when we try and push out our line, to create additional channels by uniting the levels. I wasn’t very interested in astronomy or astrology until recent events when all the Scorpios in our group gathered together and started hissing at each other. One needs to ask an astrologer about the impact of stars. I’m not astrologer, I’m a traveler but I know that planets affect us. Some time ago I liked to travel in a certain way: In dreaming I would lay down in the same position as I lay down in this world in my own bed. It worked even better when I was in the desert. I aligned positions of dreaming. At that time, I didn’t yet know how to travel to the Double and to the Dark Sea, but I managed to travel to the closest planets and even galaxies. I liked to jump to the Moon. It was a small jump. There I again lay down in the same position. I did this because around our planet there is a very strong field of human thoughts, but on the moon it is almost non-existent. After that, from the third position on the moon I jumped further, usually Mars, Jupiter and beyond. For example, one of these travels was to the largest star in the Orion constellation (Betelgeuse). This star didn’t look so enormous from this position despite what I had read... that it is incredibly enormous. Rotating around it there was a celestial body about twenty times smaller but still very large and it was surrounded by a black cloud and there was a glowing fiery tentacle protruding from it. It may also have been a star. I looked at them for awhile and I thought wow! It’s so great! I didn’t know what to do with it and I returned back. Later I travelled to the other areas of Orion. I met civilizations there, with curious beings. Some of them were humanlike or dragonlike. I interacted with them a little bit. I also tried to jump to a remote galaxy and I managed to do that but perception there was very blurry. I saw it as a compilation of moving coloured balls. They were glowing. Each one had few colours. But most interesting was my interaction with beings similar to me that lived in the sleeve of Orion, in different areas around different stars. They seemed to me that they were very wise and conscious. After we started to come out to the upper levels of the Dark Sea of Awareness, closer to 11th and 12th levels, the Dark Sea gave us the exercise of entering the field of a star. It was very interesting. The stars, when you converse with them directly, are very lovely, spontaneous, and charming beings. They sort of smile. They are like children. They smile, they are naive, they don’t have any negative impulses. Our task was to penetrate their surface, find the inner channel which originates at the center of the galaxy, go through the bubble of the star, and fly back and forth in it. They agreed. They were amused and gladly agreed to such an experiment. This way we were supposed to accumulate energy for more distant journeys. The star’s energy integrated with our energy. Then we brought it to the planet. That was all, but it was very important… But it was few years ago. One of the scarey stories from our travels, was about the whirl from the black plates that break cocoons. The other story was that at the edge of awareness and the outer limits of the 6th level of density there is a gigantic entity. It is very possessive , greedy. It consumes stars, universes, galaxies. And in 2012, one of the tasks we did in preparation for the transition of the Earth to the new ray, we went to the forbidden field of this “scrooge”. Our task was to go there, scoop some of its energy, and bring it to the planet Earth. And this giant ruler of power wanted to capture us. At the same it tried to capture us, it scooped a few stars, but we escaped as we were the small ones. There is also such a thing as darkness. The darkness is shapeless. It is very powerful but it doesn’t have goals. For example: one of the tasks we had, was to pass through the part of darkness that is situated at the center of our galaxy, and transform it. We all were there. We were offered to enter the darkness, but in order to do that we had to die. “You’ll enter but you’ll die”. We all crowded together. I felt that all my companions hid behind my back as I was large and could shield them… And so I went forward. I thought to die once more i’s not a big deal. When I entered the darkness it rolled upon me with huge waves. Since I had experience interacting with the Dark Sea of Awareness, I decided to structure what I’ve encountered. A wave of this dense matter of this level (the darkness also had levels) hit me, and I started creating there sort of little structures of same shape: glowing cubes, triangles. To be precise I just gave an idea and this matter itself created all this. This matter is actually the Creator, the First Creator. This way I crossed four levels making structures more and more complex. I didn’t even notice that my companions were following me. On each of these levels I literally died. My awareness was squeezed out of me, but then for some reason I was conscious again. My companions were following me and we died and were born again. When I reached the centre of the Galaxy, it looked to me like a black cavity. In the centre of the Galaxy we met strange energy structures. They reminded us of pen caps. These creatures were sort of judges. They emanated some kind of wave of demands. They said: “you’ll be punished for coming here as you didn’t have any right to be here” (there weren’t words of course). And then Yan Manuel appeared behind my back and pounced on them; and in the end we were able to scatter them away. They weren’t ready for that! ... to be treated the same way as they treated us. We literally quarreled with them. So it turns out that earthly bullies and boors can handle these galactic caps. After that we jumped to the original position before the darkness and then we returned to our bodies. But it was scary. Prior to us meeting these caps it was rather scary. The most frightening is the flyer. When you move towards the Flyer, you feel it’s fear and you think it’s your fear. And this is truly scary. After you dispose of the Flyer nothing can really scare you anymore. They Flyer, in reality is a rather small thing but very annoying. The Flyer is these rings. ​It has a hook also composed from rings. When it moves back and forth, the energy that is coming from us is moving through it and it leaves. Also, as I already explained, newborns have a very complete energy. I’ve already shown you the strange photograph of the little girl that was shining. In truth we are being raised by our parents and at the same time we are being raised by Flyers, because they select certain vibrations. In the human cocoon there is a structure of currents drawn in blue here. Under the impact of our rearing, and the Flyer influence, energy knots and currents appear in certain areas of our body. One could see them as a kind of octopus. For example this hook that is stemming for the forehead is cultivated by flyers. All these cultivated currents lead to important organs of the human body. Through them the energy is drained. The Flyer hovers above, pulling threads. Among the threads there are ones it cultivated, and practically belong to him. And thus it harvests energy for itself. People can possess very flexible energy, but it is not so, for many reasons. First of all... humans do not possess sufficient free energy in order to be flexible and fluid. I call it... "My beautiful creative energy" It sounds a little weird. When and if a nagual achieves the Dome of the Nagual… he needs to create something. For that, he generates several bundles of energy which he deposits in a certain energetic level. Different Naguals do different things. For example, the one who was called Don Juan, created a very complex system from this energy. He attached fibres to himself ... with kind of little bubbles… that allow Tensegrity practitioners, under certain circumstances, to remain in his field and this way they can attach themselves to his Nagual, and this way remain in high levels of awareness. I discovered the opportunity to create something from this energy later. When I had such an opportunity, I created three reservoirs of this energy. It’s called “my beautiful energy”. I don’t know why. In the middle reservoir there is a special feature. One can see through it... the petals of the Universe... new Dark Seas and their copies. Through this reservoir the conscious petal can get through to the Dome of the Nagual. What you heard now may sound weird, but it works beautifully. This way... through this channel, my companions were able to get over there. And this is exactly the reason why I’m telling you about all my travels, about the Dome itself and about this reservoir… in order that those who put an effort to remember the petal, or to be more precise, the memory of her or his petal, could easily get through to any level of awareness. I try to look beyond the boundaries. The Dome of the Nagual is the first copy of the flash of awareness of the darkness. Our Dark Sea of Awareness ,and the group of similar Dark Seas, have accumulated enough impressions within themselves. They no longer need to continue to explore, on and on, their possibilities. They know them. The time has come to go back... explore the way back, to understand why they are where they are, and why all this happened. In this Dome of the Nagual… we are not the first ones who got there. There is an opening where we entered it, but there are other holes made by others who also tried to do this… In principle, this is a projection and we are all projections. Why not project ourselves into other, incredible things. Don Juan Matus is now in the area where all Naguals who managed to reach the primordial copy are. All the Naguals who managed to penetrate that area are over there. We call it the Garden of the Nagual. Why I specifically mention Don Juan is because, he was one of those who did something for humanity to evolve. Many others were absolutely indifferent.They just enjoy the presence of their beautiful archetypal energy… which appears at the moment of alignment of the Nagual and the archetypal copy. They feel very content.